The interior lighting for this cosmetic and fragrance company not only supports the daily activities, the architectural design ingeniously integrates beauty products as metaphors, and the lighting plays with the refractive and reflective qualities of light thru glass. 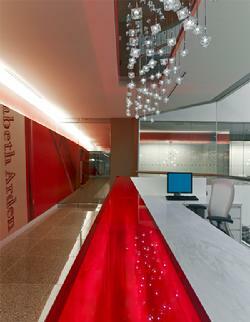 The visual impact begins at the entry with a red glass receptionist desk back lit with white LED’s, and a decorative chandelier suspended above to welcome visitors. 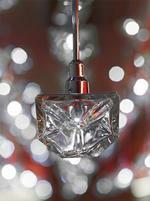 92 glass perfume bottles are suspended at various heights to create a cloud of sparkle. 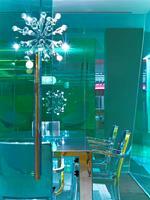 Each bottle, equipped with a ½ watt white LED, creates a lively and kinetic sculpture. This play of light sets a tone and lighting concept for the remaining spaces. 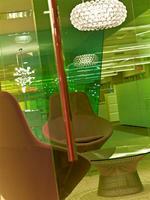 Glass enclosed meeting and lounge spaces form abstract and over-scaled containers of light and defined by transparent saturated colors. Each volume contains a variety a suspended decorative chandeliers - each with a different play of light thru translucent and transparent materials, and exposed lamps. The lighting design not only supports the functions of this office environment, but also shows how light can be playful and unique with appropriate selection of materials and light fixtures.